A passer-by who helped pull two critically injured men from a burning plane has been given a bravery award. Window-cleaner Nigel Gallimore, 40, has received a Queen's Commendation for Bravery for rushing to help the light aircraft's occupants in September. 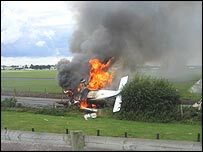 Mr Gallimore, from Throop, Bournemouth, was on a day out when he saw the crash near Bournemouth International Airport. He dragged Dave Bougourd, 68, and Robert Le Page, 54, from the Channel Islands, to safety. Mr Gallimore then ran back to help a third person but was beaten back by the flames. The third victim died in the wreckage of the 16-year-old Socata Tobago. The aircraft crashed after its wheel clipped a fence just outside the airport, the Department of Transport said. Mr Gallimore was in the nearby Alice in Wonderland Park with his wife, Helen, and their two-and-a-half year-old daughter. He jumped over the fence to get to the crash site and was helped in the rescue by a passing van driver, who did not wish to be named. Mr Gallimore said he would do the same again and that being called a hero was "a bit strange". He said: "I am surprised I have been nominated but I am not happy that the van driver Mike has not because the plane nearly hit him and he was there holding the pilot's hand when I went to help." Mr Gallimore said the plane hit the fence just feet in front of him and his family. "I remember it like yesterday," he said. "I jumped over the fence and the plane exploded and I ran through the flames, saw Mike and grabbed one of the men and put him on the road and then went back for the other who was badly burned and I picked him up. "At the time my wife had a bit of a problem because I disappeared behind the plane and it exploded and she did not know what had happened. I just didn't think about it. "If I thought about I would not have done it. I do not think I'm a hero."